A new study by the Intelligent Design group The Discovery Institute found that evolution makes people less likely to believe in God.1 This should not be a surprise to anyone who has been engaged with the creation/evolution debate for a significant period of time. According to the study, not only evolution, but the big bang and suffering are also stumbling blocks for people. While the Intelligent Design movement successfully counters an unguided process of evolution by pointing to the obvious design in living things, it does not counter theistic evolution, deep time, or the problem of death and suffering. The most effective way to promote belief in God’s Word is to proclaim its truth confidently, from the very first verse. This shows the error of organizations like BioLogos, who promote theistic evolution as the only viable view in an age of science. The most effective way to promote belief in God’s Word is to proclaim its truth confidently, from the very first verse. While they think they are well-meaning in trying to ‘harmonize’ Scripture with science (actually be deferring to evolutionism as their authority), such surveys show that their thinking is completely upside-down on this issue. Of course, only biblical creation grounded in God’s word starting in Genesis has the answers that can resolve these problems. And when people, especially students, are exposed to this vital information, it can strengthen their faith and help them remain strong against secular attacks. Only biblical creation grounded in God’s word starting in Genesis has the answers that can resolve these problems. We show how this is the case in our groundbreaking new DVD, Fallout. This was a survey of youth in college campuses who provided their reasons for staying in, or departing the faith. The key issue for apostasy was actually a belief in evolution—just as The Discovery Institute’s survey found. With over 30 years of experience sharing the creation message in churches around the world, we know how powerful this information is. Other surveys show anywhere from 60%2 to 88%3 of children who grew up in church will leave during their college years. So, why ask college students? Because despite us banging this warning drum for many years, the importance of taking a stand on Genesis does not get through to some. Fallout shows, very powerfully, in their own words, exposure to creation information played a key role in Christian students staying in the church. So this information has real eternal consequences! How could this information help your church and your family? If there was something simple that you could show your children that could help them stay in the faith, wouldn’t you want to know about it? We are making Fallout available very inexpensively in quantities of 10 or more so you can share this information with those you care about. 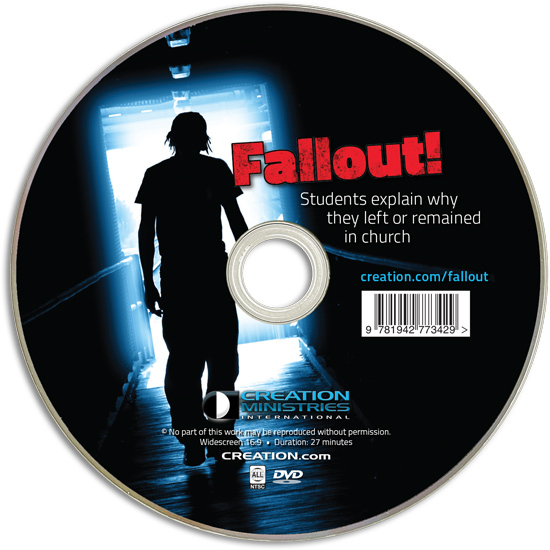 I thought you would be interested to know that the Fallout DVD was distributed to ~125 students at Bangor Christian Schools earlier this week. Our senior pastor felt it was important to get it out to them given our year long chapel series on apologetics. Would you help us spread the message? Share a few of these inexpensive DVDs with your church leaders and youth. And then call on CMI for a creation presentation in your church. Vital information for pastors, leaders, and parents! The Discovery Institute, Darwin’s Corrosive Idea, November 2016; discovery.org. Return to text. Barna Research, Most twentysomethings put Christianity on the shelf following spiritually active teen years, 11 September 2006; barna.org. Return to text. Walker, J., Family Life Council ays it’s time to bring family back to life, 12 June 2002; sbcannualeeting.net. Return to text.